The Gleeful Gourmand: Review and Recipe: "Treme: Stories and Recipes from the Heart of New Orleans"
Review and Recipe: "Treme: Stories and Recipes from the Heart of New Orleans"
The first and only time I've been to New Orleans was about three months after Hurricane Katrina slammed into Louisiana. It was Thanksgiving, and we were down to visit my brother and sister-in-law in Baton Rouge. I had never given New Orleans much thought before the Hurricane, and before that trip: Mostly it was the place that to my Virginia born-and-bred imagination seemed like a hedonistic party town. Little did I know back then what an amazing, enchanting city New Orleans truly is. I fell in love with the great state of Louisiana on that trip, and subsequent trips made. The food, the music, the way of life - I was all too easily charmed. But on that November day when we journeyed into New Orleans, all those enchantments had a harder time of reaching the tourists. We savored the food - a few places in the French Quarter were open - but we could not look away from the blown-out windows of some the tallest buildings. We saw some sights that tourists usually see, but we couldn't shake the sense of heartbreak and struggle that lay like a pall over the city - and we didn't want to. We crossed Lake Pontchartrain, beautiful in the late afternoon, but all we could think about was how her waters had crushed everything in its path. I was enchanted nonetheless, because beneath the heartbreak of so many lives lost, and so many lives displaced; behind the closed and shuttered doors of so many great restaurants, you could absolutely feel the heartbeat of the city going on. Like a radio that's been turned way down, so strains of music are barely audible, but still there, it went on. And the band played, sprawled on the ground at first. Someone turned the dial up, and little by little they staggered to their feet to blast the music. Because the people of New Orleans knew that despite such horrific destruction, and failures on every level, there must be food, and music, and soul. Most places on this earth don't fare well without those things, but it is especially true in the Crescent City. I was approached a month ago by the Junior League of Richmond to promote their 69th annual Book & Author Event (see my earlier post - it takes place April 30th!). They thought I would be especially interested since one of the guest authors is Lolis Eric Elie. 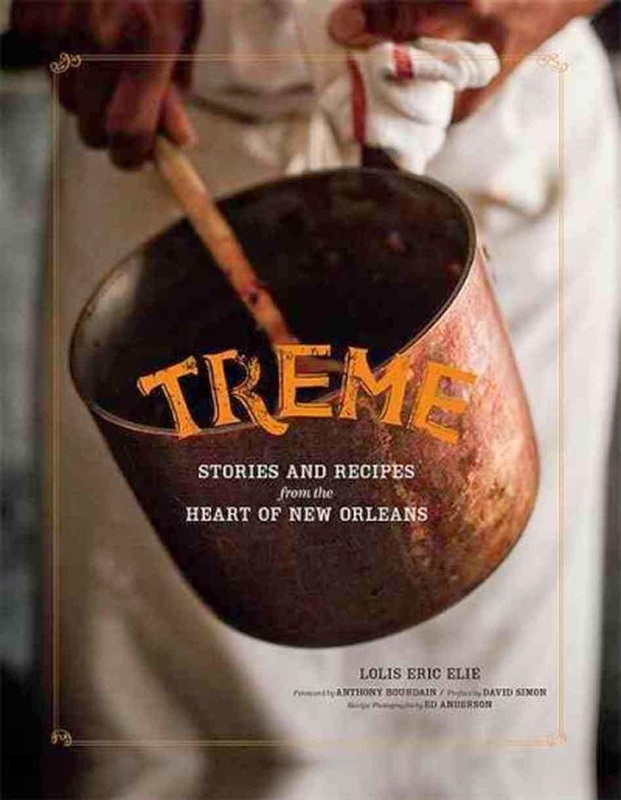 They asked if I would check out his book, "Treme: Stories and Recipes from the Heart of New Orleans," give it a review, and maybe try out one of the recipes from it. I have to admit, I hadn't really done my homework on his book. I had never seen the acclaimed HBO series "Treme" on which it's based, and I didn't read the back of the book, I just kind of dove in. I suppose that's why about a third of the way in I became thoroughly confused. Even though writer and Executive Producer David Simon had warned in his preface that this "wasn't a cookbook," I still kind of thought it was. It's not. A few pages later it dawned on me that all the stories being told were from the point of view of the characters from the show - a show I had never watched, mind you. 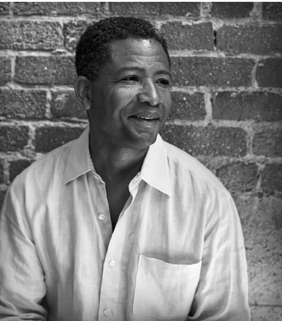 The storyline of the show begins three months after Hurricane Katrina hits, and follows the lives of chefs, musicians, Mardi Gras Indians and many others as they try to rebuild their lives after the destruction. The book seems to hover without a timeline, but I gathered it is supposed to take shape years later. This gorgeous recipe and story collection is spearheaded and narrated throughout by the character Janette Desautel, a chef and restaurant owner in New Orleans. Her voice weaves expertly in and out of other character's stories in the book, guiding us completely in everything you ever wanted to know about New Orleans cuisine, and its origins. Yes, the book contains recipes from famous chefs such as Emeril Lagasse, David Chang, and Eric Ripert, but it's the recipes that come from some of New Orleans' own famous chefs and restaurants (think Commander's Palace) that are the most interesting. Each chapter is devoted to a character speaking in his or her own voice, talking about either the food they grew up on or the food of New Orleans they love, with corresponding recipes. Despite their being fictional, the emotions are real enough.The only problem I had was that sometimes I wasn't sure which chefs and restaurants were real, and which were fictitious. But in the end, it didn't matter that I hadn't seen the show. I was completely absorbed by this book. I actually learned so much about New Orleans cuisine, old and new, that I felt like my head was going to burst with information - in an entirely pleasant way. For instance, I now think I finally understand the difference between "Cajun" and "Creole," which is something the book tells us even native Louisianans have a hard time defining. But I'll be darned if I'm going to try and explain it here! The simple explanation is: It's complicated, but it's worth reading to figure it out. I loved this book, and despite being the only cookbook (oh, sorry, it's not a cookbook) I've ever read that's entirely driven by fictional characters, it really spoke to me. The writing is flawless and draws you in. It dusts you with Creole seasoning and doesn't let go. I can't wait to rent the series now and watch from the beginning. I decided to try one of New Orleans' most traditional and beloved desserts, bread pudding. The recipe comes from Frank Brigtsen, James Beard winner, and owner of Brigtsen's Restaurant which serves authentic Creole and Acadian fare. 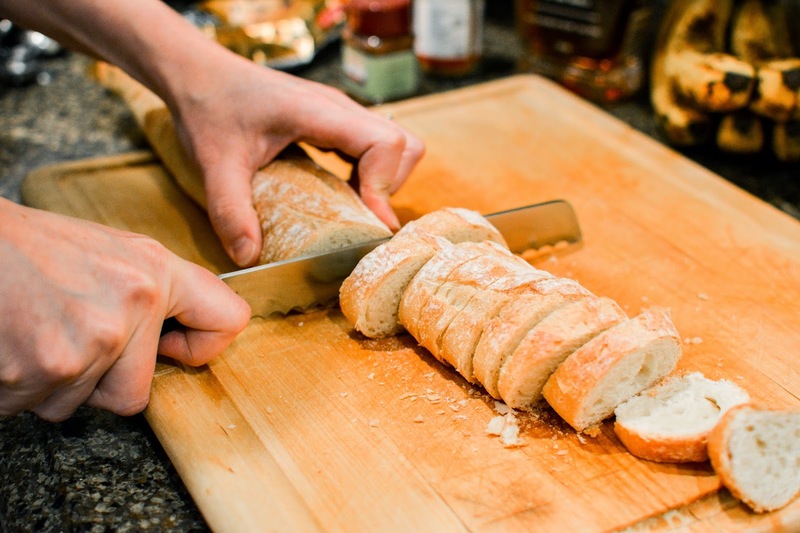 As Frank puts it, since so many New Orelans meals are served with French bread, there's always leftovers that turn stale. 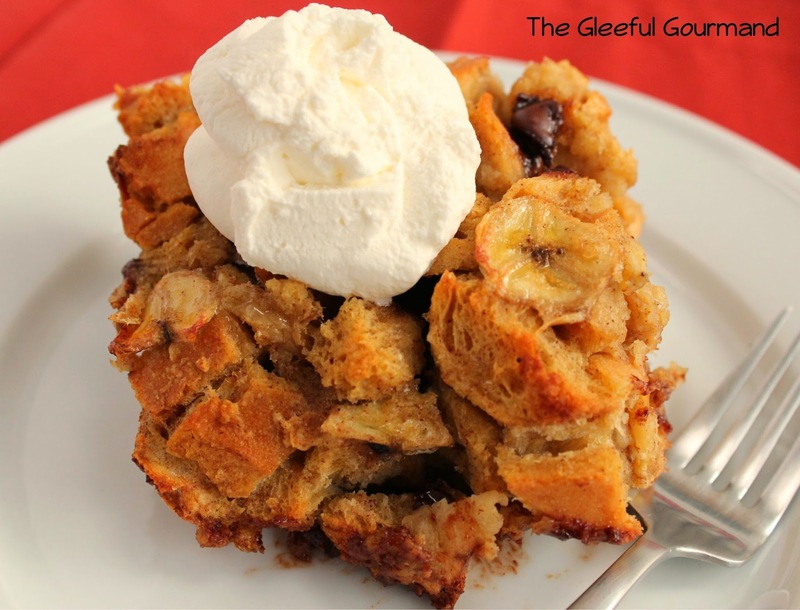 Bread pudding is what you do with those leftovers. I loved reading the corresponding essay "A Brief History of Bread Pudding" and since I'd never made bread pudding before (but always loved it), I knew I had to test it. It was delicious, and even though it's banana bread pudding, the banana isn't too overwhelming. Since I didn't have any raisins on hand, I swapped in chocolate chips, which was excellent, and a splash of bourbon for good measure. We loved it, but my only complaint was that the top gets a little dried out, and could have used a good hard sauce poured over it in addition to the fresh whipped cream. Otherwise, it's bread pudding heaven. • 1 cup granulated sugar, plus 1 tsp. In a large bowl, whisk together the whole eggs and egg yoke until frothy. Add the mashed bananas, the vanilla, cinnamon and nutmeg and whisk until well mixed. Add the 1 cup of sugar and brown sugar, and whisk until dissolved. Add the milk and whisk until well blended. Add the bread cubes to the bowl and stir until the bread has absorbed most of the custard. 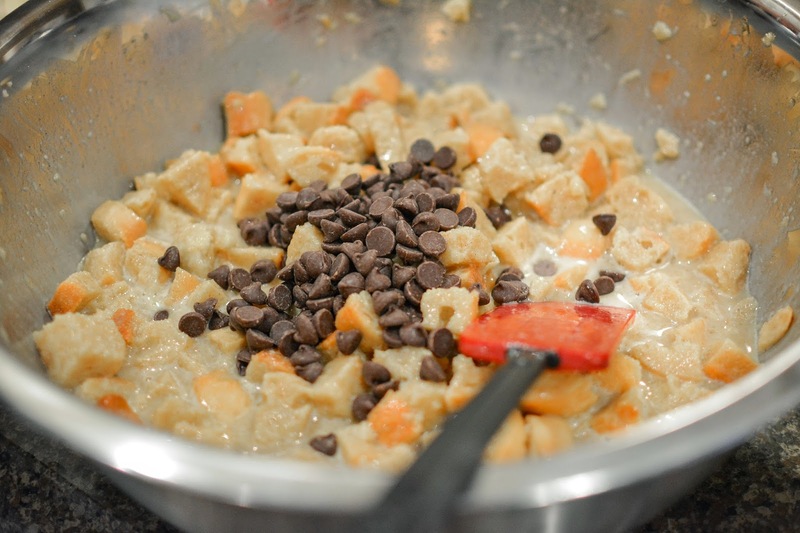 Add the raisins (or chocolate chips) and sliced bananas and stir to mix well. Pour the bread pudding batter into a shallow baking pan (I used a 9x13 pan) and let stand at room temperature for 30 minutes. Place the baking pan in a slightly larger pan and pour in hot water to come 1 inch up the sides of the pudding pan to form a water bath. Bake, uncovered, until a toothpick inserted ito the center comes out clean, about 1 hour. In a bowl, using an electric mixer or by hand, beat the cream until soft peaks begin to form, about 3 minutes. Add the 1 teaspoon sugar and continue beating to soft peaks, 1 minute or 2 longer (or a little longer if mixing by hand). 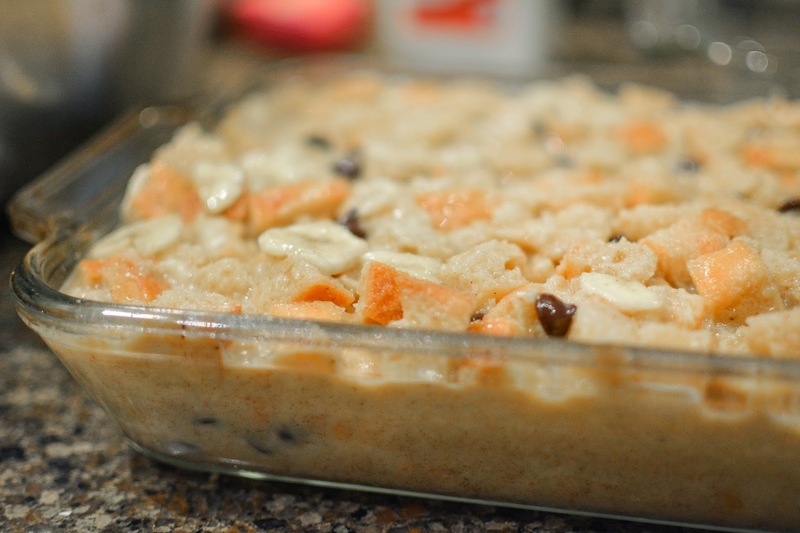 Spoon the bread pudding onto serving plates, top with a dollop of whipped cream, and serve at once.